We knew there were major problems here, having done a temporary fix to keep the floor from collapsing a couple of years ago. The house had sat unoccupied for many years. 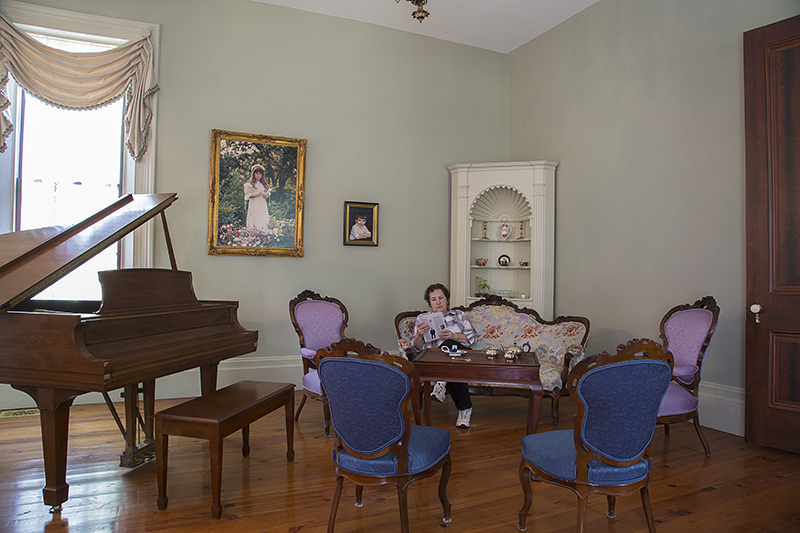 Long before the Nuckolls family sold the place in 1984, the entire foundation in the foyer had given way and the floor had fallen to the ground. The new owners jacked the floor up and propped it with a haphazard assemblage of cinderblocks and stacks of lumber varying from 2 x 10s to 1 x 4s. 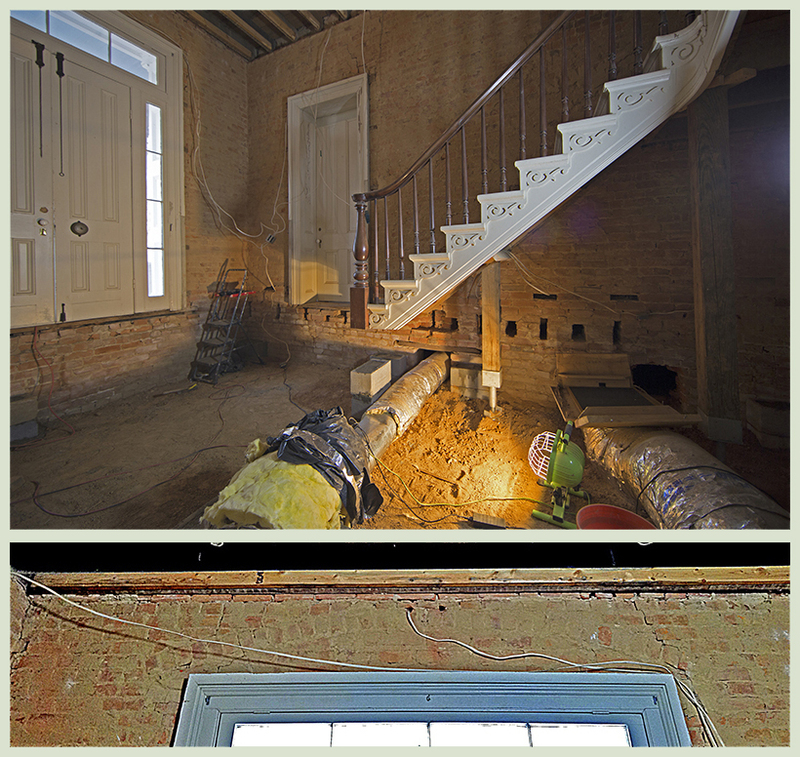 But the problem was with the joists, which had originally extended into openings in the brick walls. The tails of the joists had all rotted out and the foundation was no longer supported around its periphery. The foyer gave one the sensation of walking around on a pedestal table: it seemed to tip a bit when nearing one of the doorways. 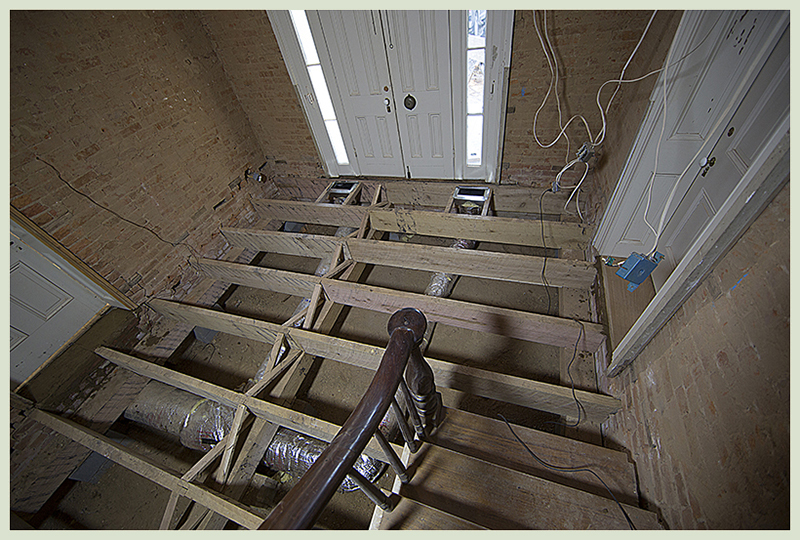 Closer inspection revealed all but two of the original joists were severely rotted. So we took the floor and entire foundation out. Sixteen footings were dug and filled with concrete, piers were placed, and a new foundation was built out of white oak. Here is a feature we had not encountered in this house. Most doors and windows have a heavy timber lintel serving as a header to support the wall above. The front doorway must have been considered too wide for a lintel, and the original builders constructed a relieving arch out of brick. These arches have worked since Roman times. Demolition is the easy part. Now the heavy lifting begins. 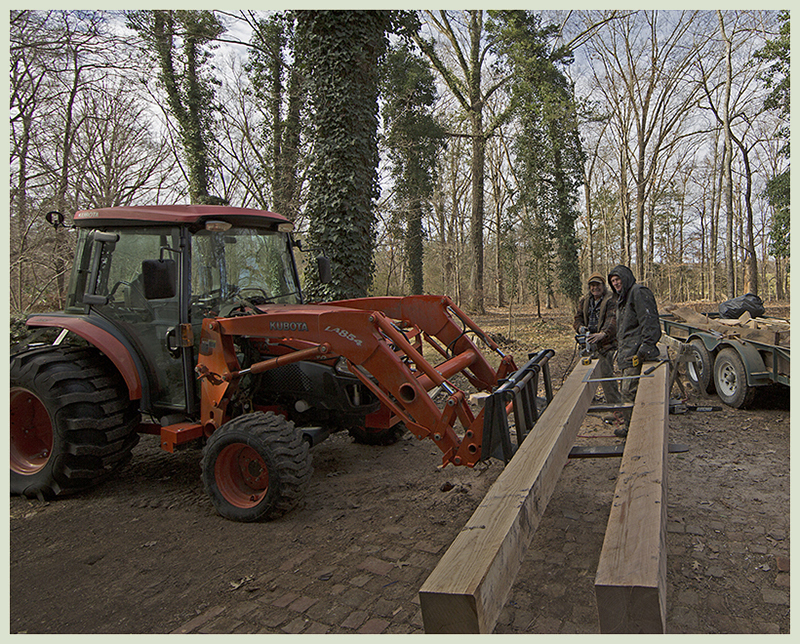 After the piers were built, 8x8 white oak timbers went down, followed by joists which were 12 inches wide and varied in thickness from 2 inches upward. Jim estimates each of these 8x8s is about 400 lbs. The beams are down, joists in place and cross braced, and new ductwork completed. Wiring is of course a mess, and makes no sense at all. We'll sort that out later. Subfloor is down. This is not historically correct, but no one can convince me it does not result in a superior final product on the interior floors. BTW, we opted also for electricity, indoor plumbing, and air conditioning. If they'd a had it, they'd a done it. But for adventurous visitors, there is an outhouse still standing back of the house. Snakes and spiders are complimentary. All of the beautiful baseboard was previously removed in favor of a wainscoting made up of 3/16" plywood and off-the-shelf trim from a home improvement store. Besides changing the look, a severe consequence of this was cutting the stairwell loose from the wall. The entire stair had about an inch and a half sag on the outer cantilevered edge. Fixing the problem was a daunting task. 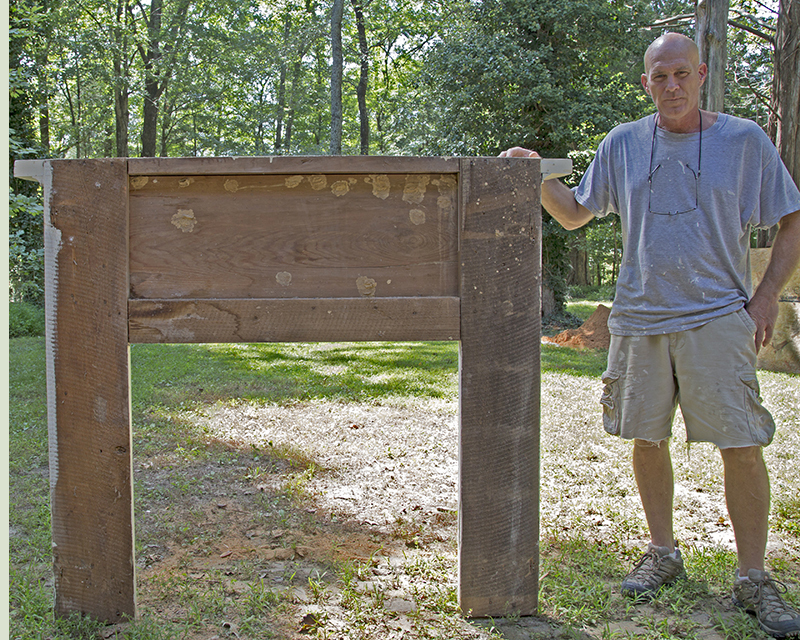 Our lumber supplier, Mr. Noonan Greene, came up with a huge piece of poplar. This 20" wide, 1-1/2" thick, 14 ft. long board became the structural back part of the rabbeted baseboard. 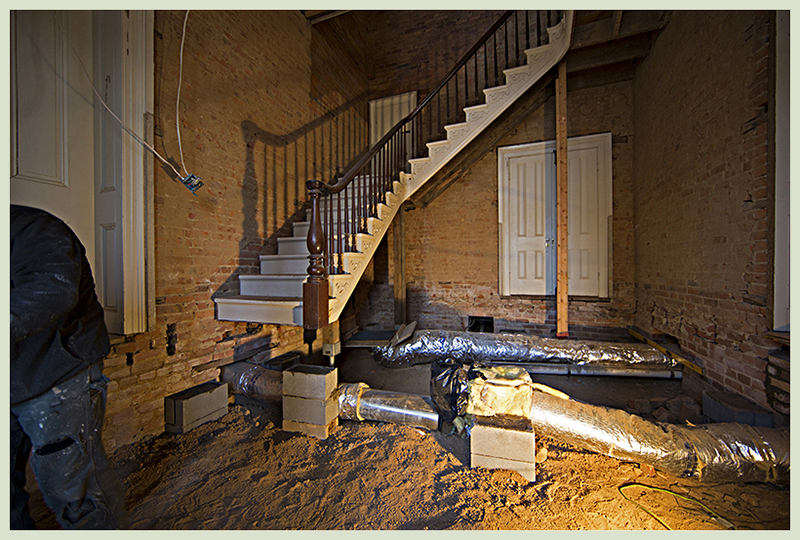 It is attached to wood nailers in the brick wall, and the inside stair stringer is then lagged into it. The front baseboard is a more modest 5/8" thick. 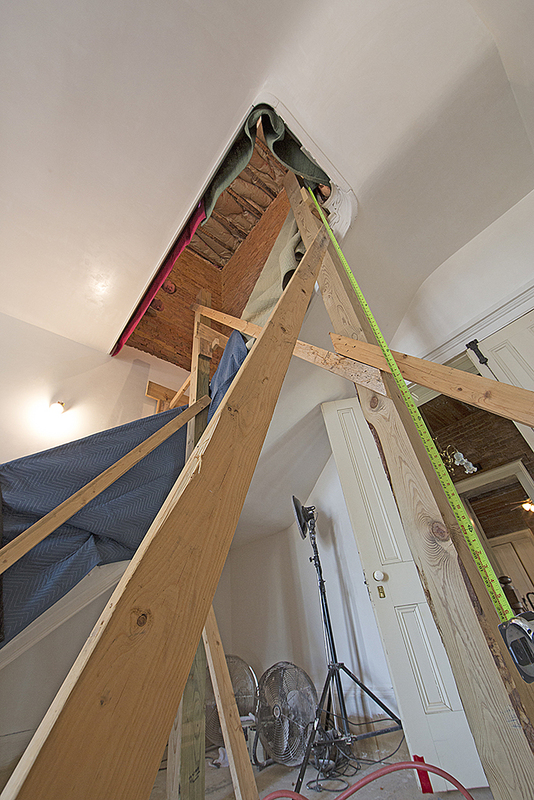 Prior to dropping it in place, we had to meticulously cut it to fit around the stair treads and risers. Jim Nolan has now made about 250 feet of these baseboards, and we have several rooms to follow. Plaster work completed downstairs. We moved on to the parlor. 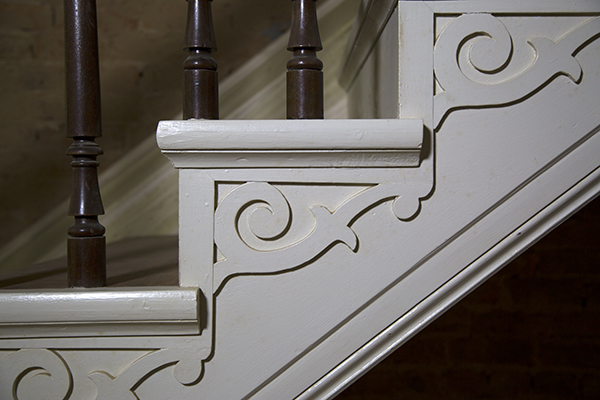 It was completely restored and then we moved back into the stairwell as shown below. It is 26 feet from the floor to the ceiling at the top of the stairs. Jim and Rocky are peeking over the rail. We're putting up scaffolding to span the stairwell. This will allow the plaster men to work their way up. A few small fragments of plaster here and there and traces of paint on original mouldings have given us hints for restoring the wall colors. Previous owners painted virtually all of the doors off-white. A few old photos show they were originally grain painted. Luckily, we discovered an untouched door in the dogtrot leading to the middle of the north gallery. It had been covered up by a modern wall. This door will remain as is to show the original technique. Photo from the 1980s. Door to the guest bedroom from the entry hall. Those are small caliber bullet holes. William Graves Mebane was alledgedly "shooting at the Yankees." Having worked on the door, we know it is made of poplar. But the grain pattern simulates a different wood. The light swirls on the panel on the right side of the picture are very much like the ray pattern in quartersawn white oak. This beautiful faux finish had sadly been covered up before we bought the house. 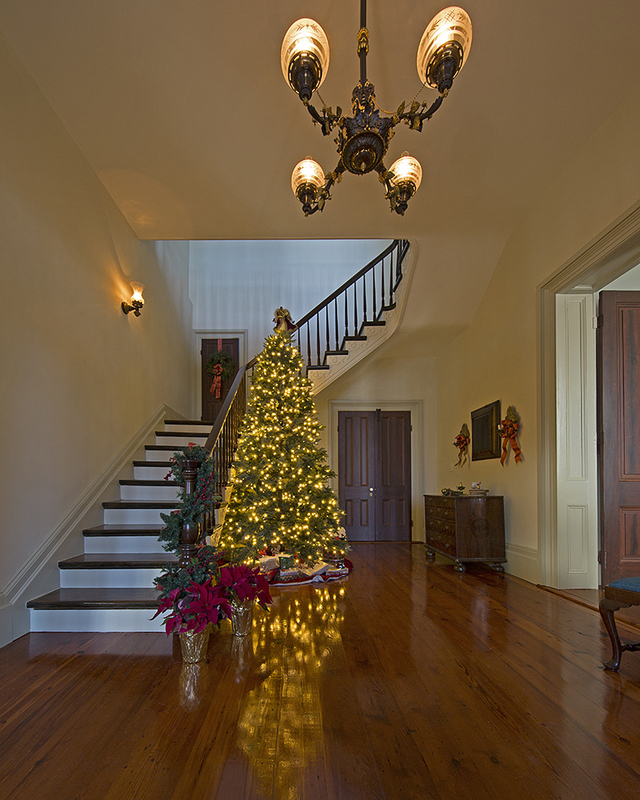 Main stairway. Plaster was removed by Mr. Perkins, but the paint scheme is original. 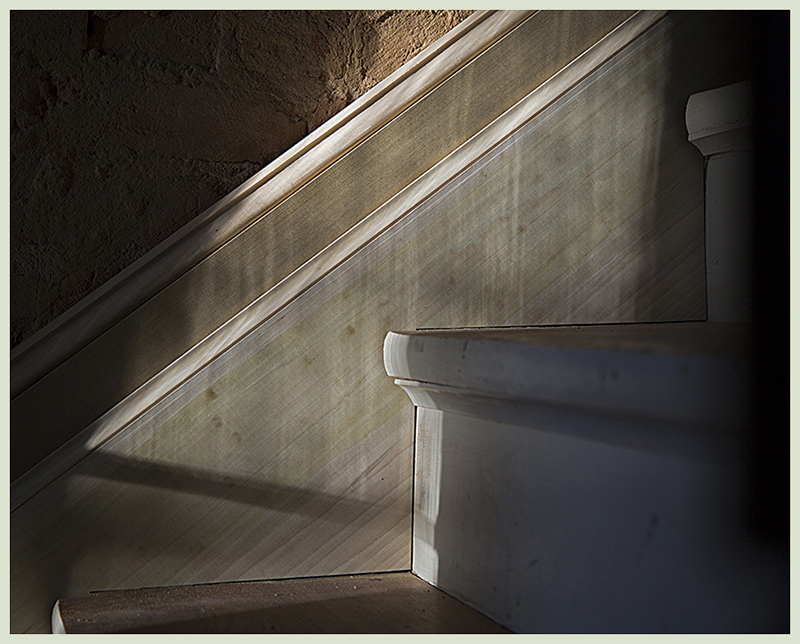 The unusual look to the servant's door into the stairway comes from his having applied paint stripper. The doors were all originally grain painted. Perhaps they were in poor shape. Maybe the previous owner didn't like the style. For whatever reason, he painted all of them. The exterior surfaces were barn red. All others were painted off-white. I was determined to go back with the grain paint. This was done almost universally on houses built in our area during the same time period. Unfortunately, we couldn't find anyone in the Memphis area who could do what we wanted. I chanced upon the website of Keith Wheatley, from Nashville. At first, Keith was reluctant. He is 63 and winding down. I directed him to our website, and he really became interested. But working 200 miles from home was a deal breaker. So I offered to bring the doors to him, and we were set. We still had half a year before he was free. But it was worth the wait. 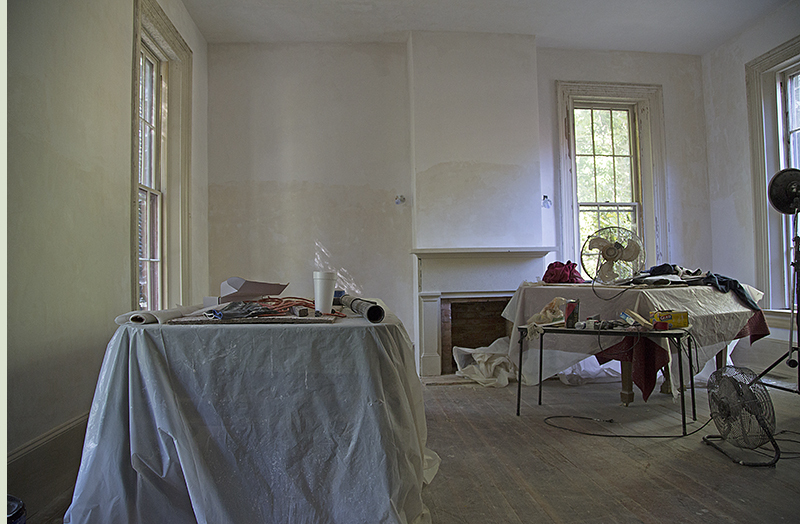 After priming, Keith started with a terracotta base coat. He then applied several layers of graining. A coat of purple resulted in the final mahogany color. This was followed by two clear coats for weather resistance. The final result is incredible! Once he came over and got a firsthand look, Keith has bought into the project. He is going to grain paint the door surround for the front entry, outside and in. And he is going to do the parlor mantle. More pics to follow! 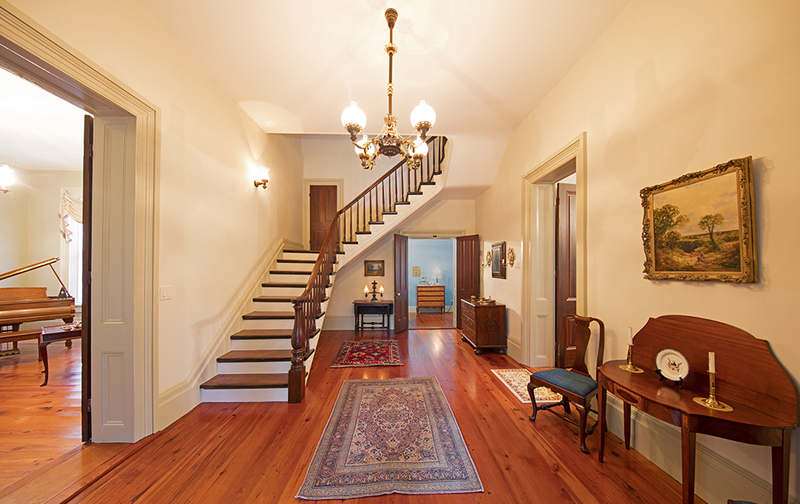 The chandelier for the entry hall came from an 1840 house in Maine. It was home to a sea captain. 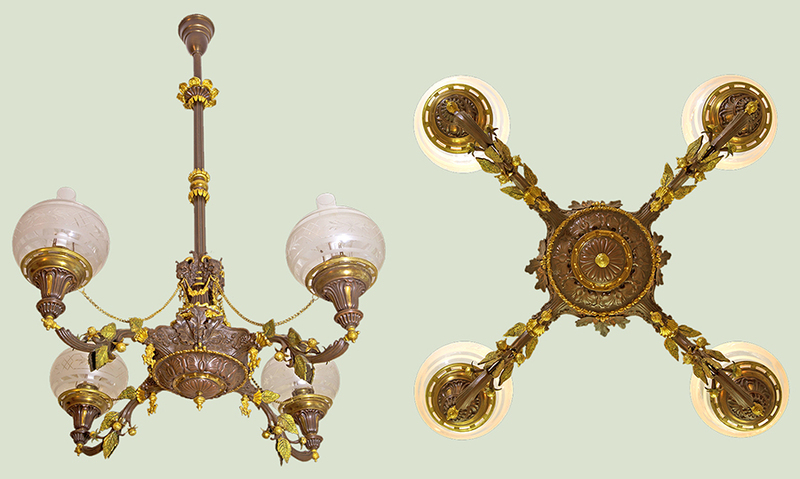 As is the case with the ceiling fixtures in the parlor and guest bedroom, this was originally designed to burn oil. 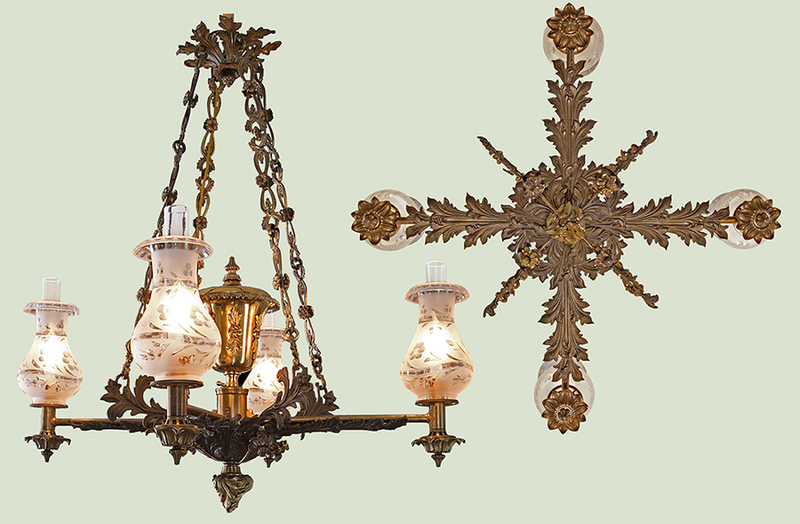 The trumpet-shaped devices below the lights are fonts that would be filled with the oil. The burner was a Solar style. We finished just in time! Antique heart pine flooring was laid down. 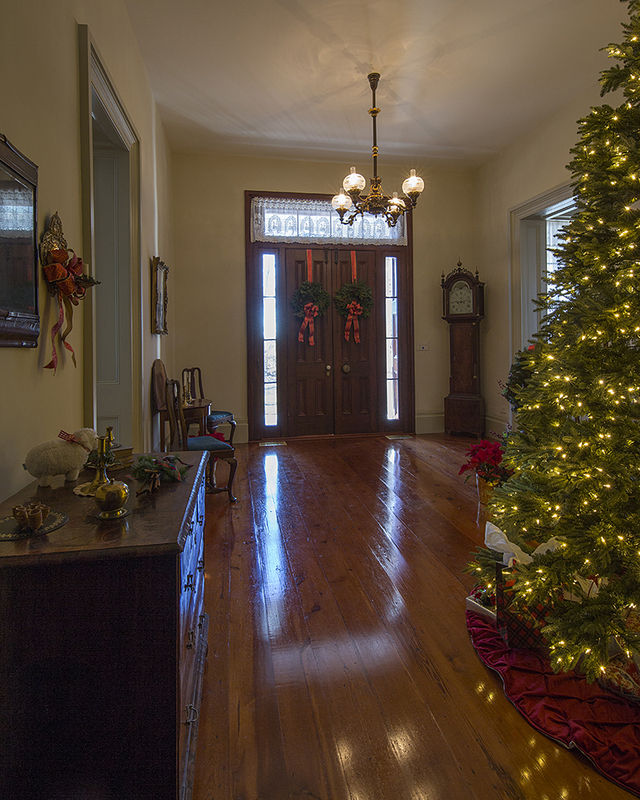 After three coats of Watco oil (an equal blend of medium walnut and cherry) and three coats of Waterlox topcoat varnish, the room was ready for decorating 2 days before the kids came in for Christmas. The front door surround and all seven doors in the entry were grain painted by Keith Wheatly. Jeanne Potts has done all the other painting on recent projects, and we especially appreciate the work she did on the stairwell. Jim and Rockie put the flooring down and finished it. Thanks to all! July 2016. All four rooms are done. 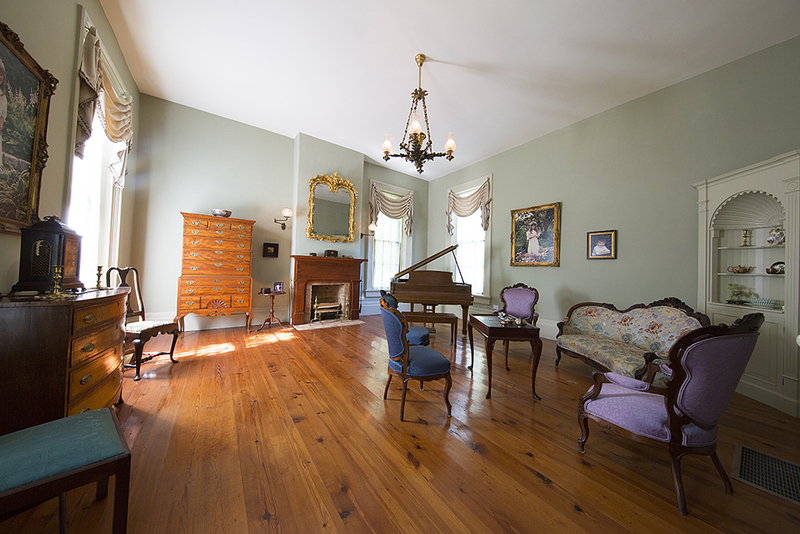 Left: parlor. 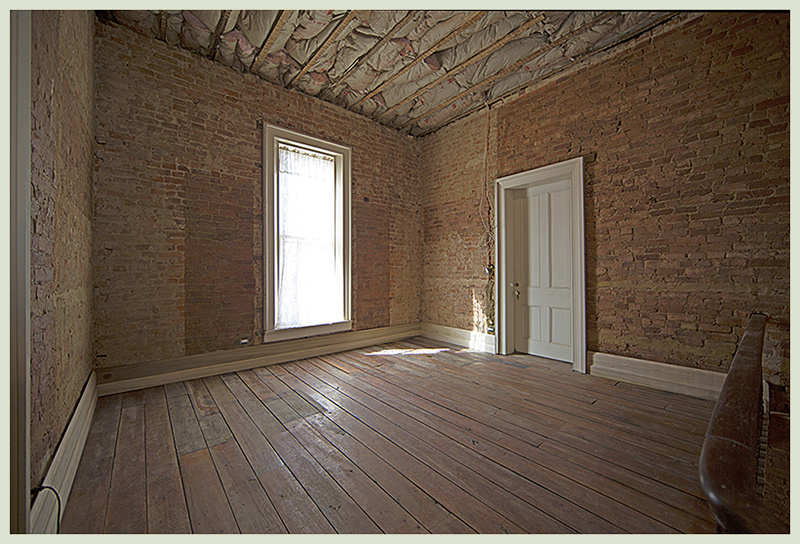 Right: guest bedroom. Back center: dogtrot hall. 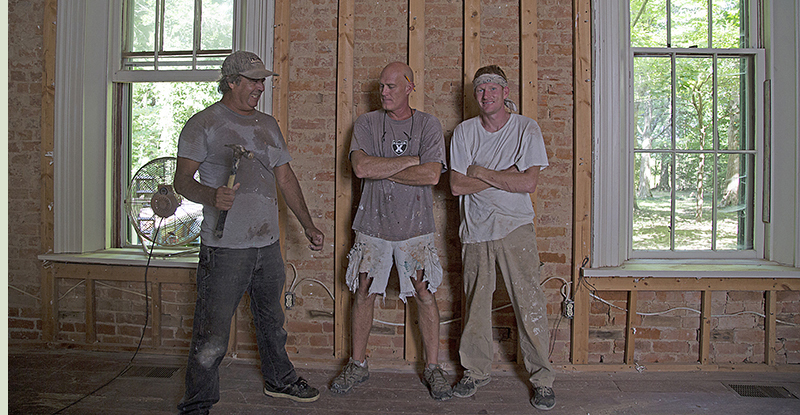 Juan, Jim, and Rocky, aka The Three Stooges, have stipped the sheetrock from the parlor and are ready to pull out the stud wall and dropped ceiling installed in the 1980s. A few weeks after this picture, Juan moved on. So it's the Jim and Rocky show now. As in the guest bedroom and entry, the previous owner lowered the parlor ceiling 13 inches for no apparent reason other than his personal preference. It certainly wasn't required for wiring or plumbing. His new ceiling, once again constructed of modern, darkly-stained beveled siding, hung just above the windows and resulted in a cramped feel to the room. 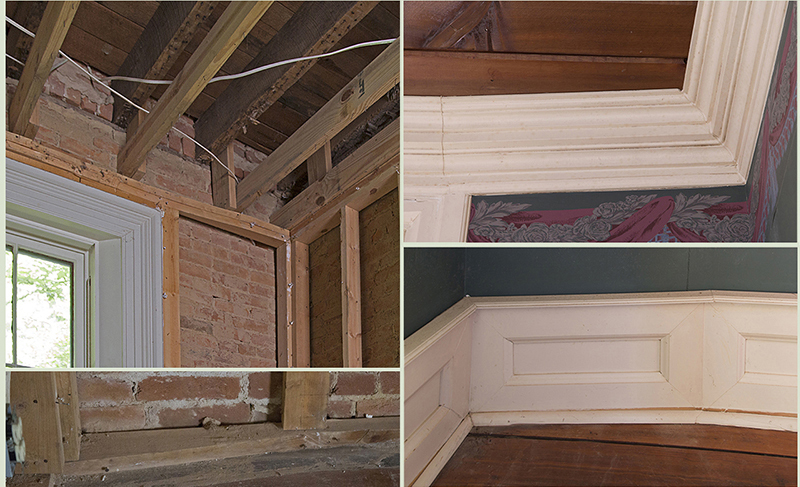 These photos also demonstrate the funky angles that had been inserted at the corners of this room and the guest bedroom. In order to put up sheet rock, a stud wall was needed. He constructed standard-thickness corners, but turned the studs 90 degrees so the walls could be thinner and match up with the window frames. It would have been so much simpler and looked far better if the plaster had been repaired. 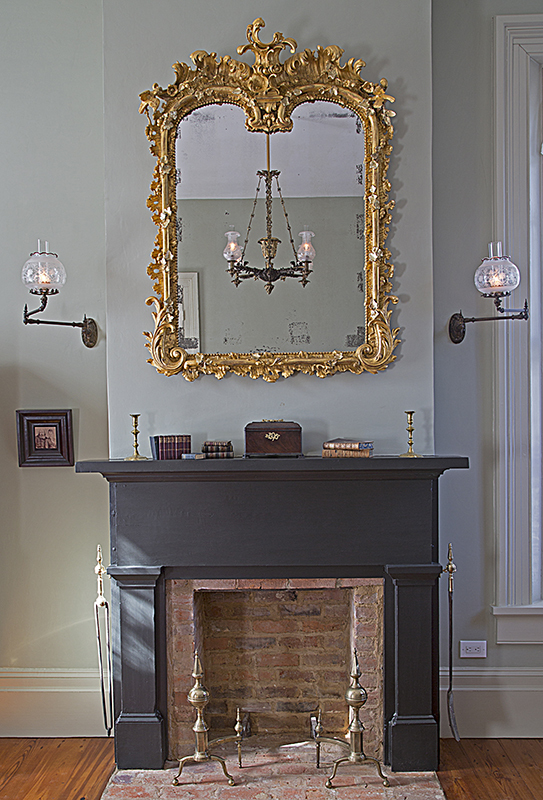 The mantel had been replaced with a much later one made of cast iron. We decided to go with the original look. Fortunately, the mantle in the bedroom above the parlor was in excellent condition. I had it installed in the parlor. We will replicate it upstairs, minus the dirt dauber nests. This photo shows the construction as viewed from the back. All of the mantels were made of walnut. The mantel is is in place. Windows are restored with the original counterweights reconnected. The first phase of baseboard restoration is done. 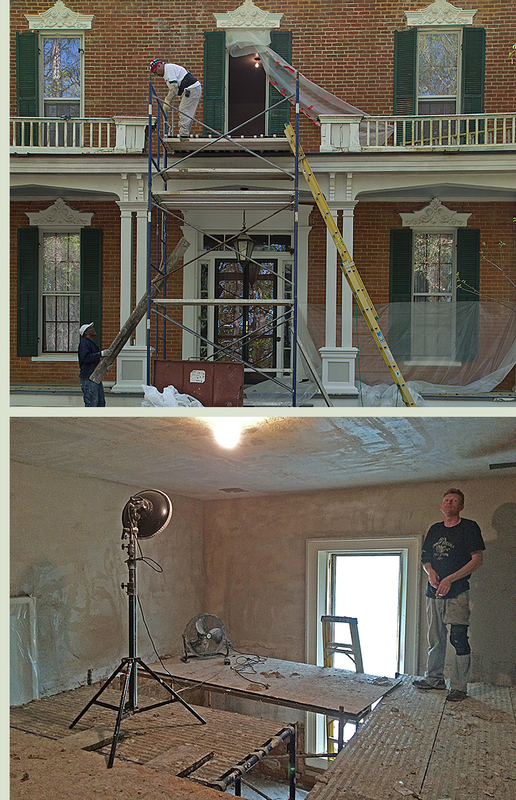 Plaster work is complete. The parlor is already opening up and will have a much more formal look! We installed an independent hvac unit and completely rewired this room. It was originally an oil burner. The font in the center held whale oil. The fixture has been converted for electricity. Brass and bronze. Shades are from the same period. 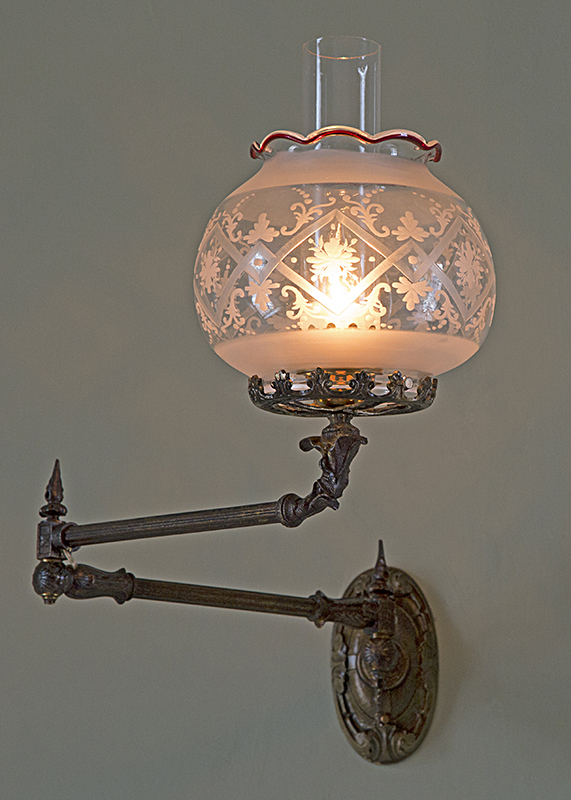 This is one of a pair of circa 1850 Cornelius and Baker swing-arm sconces that flank the fireplace. Circa 1860 French mirror. Water gilt carved wood and gesso. Gold except for the small leaves, which are silver. 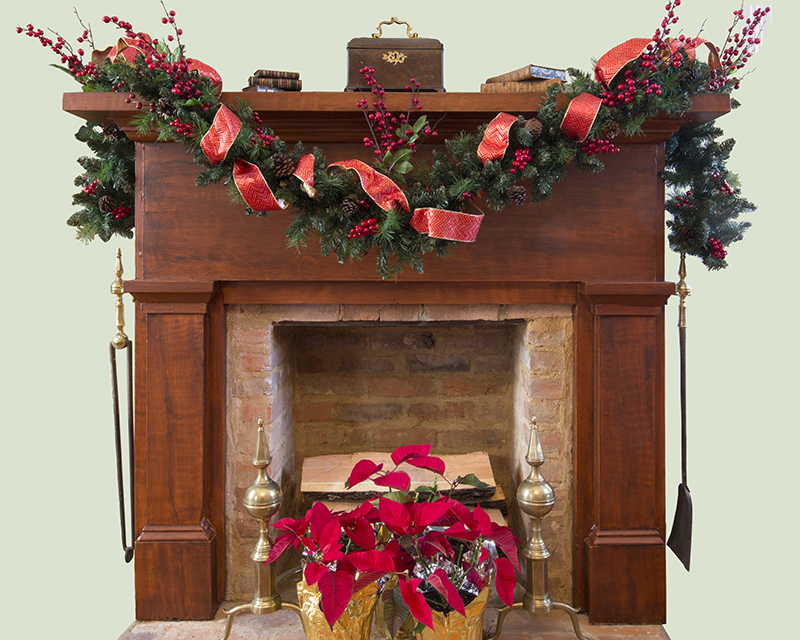 After Mr. Wheatley came on board, Bonnie convinced him to grain paint the parlor mantel. Christmas decorations are up. 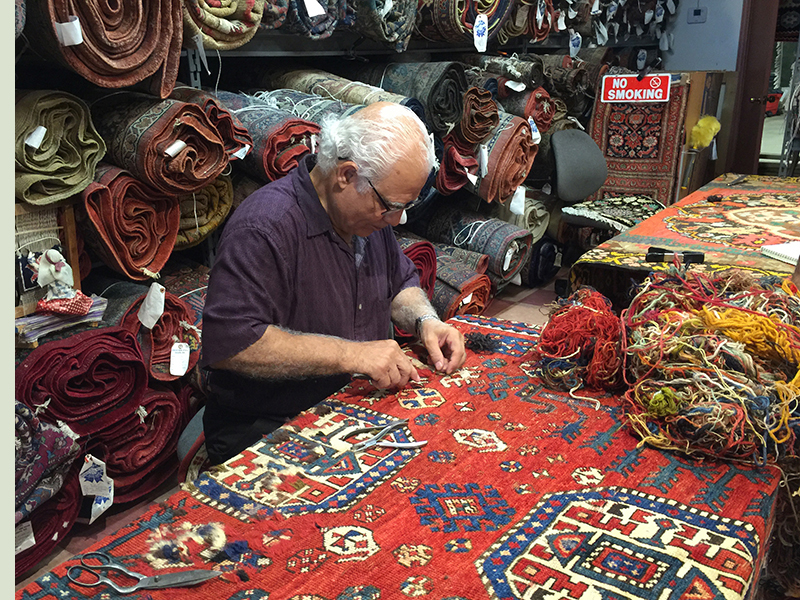 Mr Ali Taghavi is working on our Tree Kazak. There are very few people left with these skills. He started at age 3, and makes his own tools. Bonnie got together with Ken Cummins. They reupholstered the parlor furniture and we have new curtains. The rugs are out for cleaning, but that's pretty much a wrap on this project. It's time to move on. Previous owners had installed two rustic bathrooms in the upstairs foyer, effectively closing off this space and making it very dark. By now, their theme should be evident. Beveled siding was on the ceilings and walls. 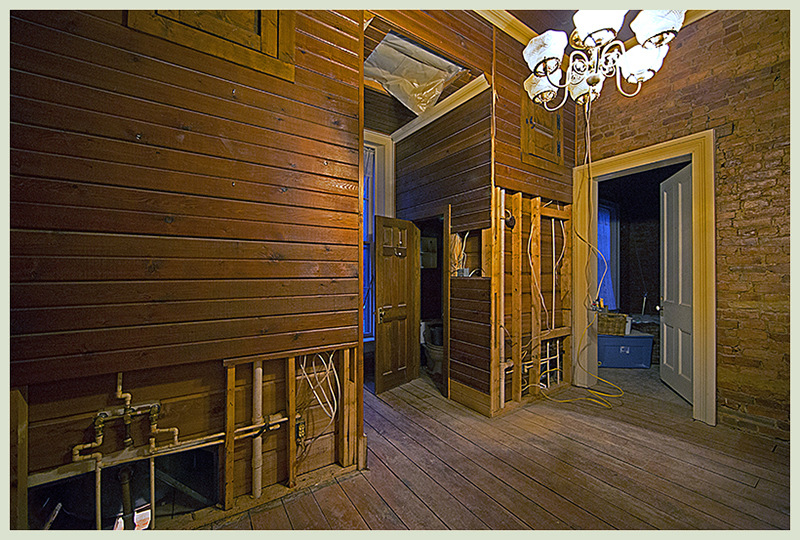 The same room after removing the bathrooms, installation of new baseboards, and floor repairs where plumbing had been. 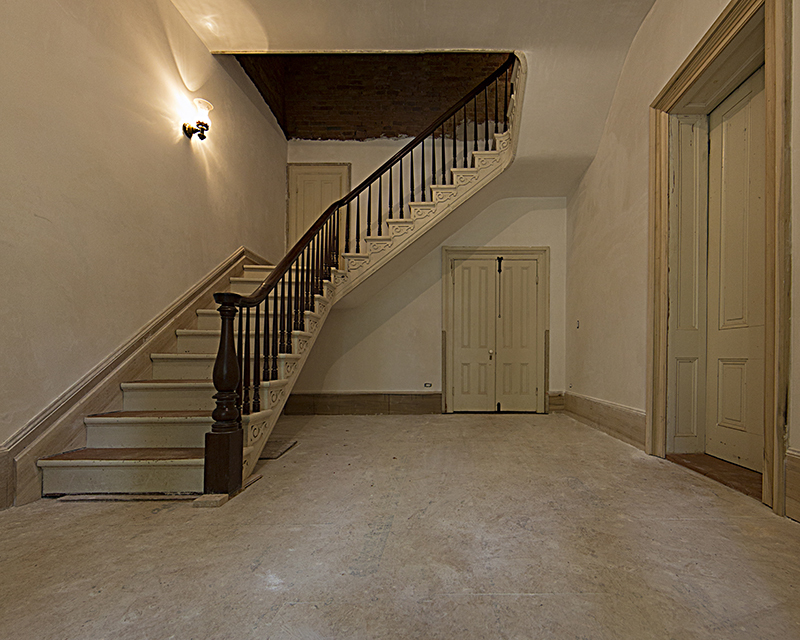 After refinishing the floor and replastering, there will be a very bright and pleasant sitting room at the top of the stair as was originally intended. The bathrooms will be en suite with bedrooms as done with the guest room. The plasterers are back at it. 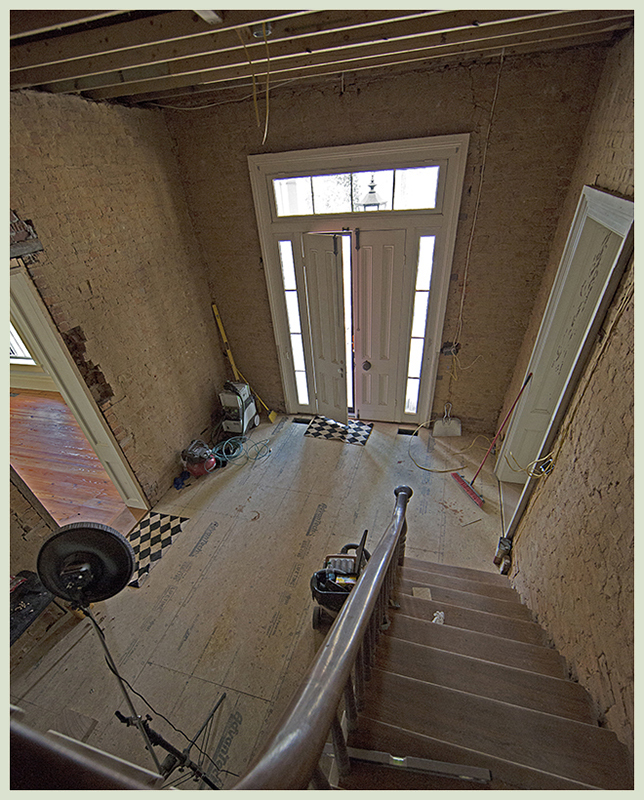 Scaffolding was erected over the stairwell and upstairs foyer. Everything below the scaffold was sealed off with layers of thick paper and plastic. Hopefully, we won't have a big mess on the floor and stairs. We want to preserve the original flooring. Jim and Rocky then removed the window and set up scaffolding outside. The only way to reach this room now is by climbing up to the roof of the porch and coming through the window. The workers are having to haul their materials up. Rocky is checking things out. The brown coat (mostly portland cement) has been laid on the ceiling and upper portion of the walls. The two doors lead to the upstairs bedrooms. More work to come!